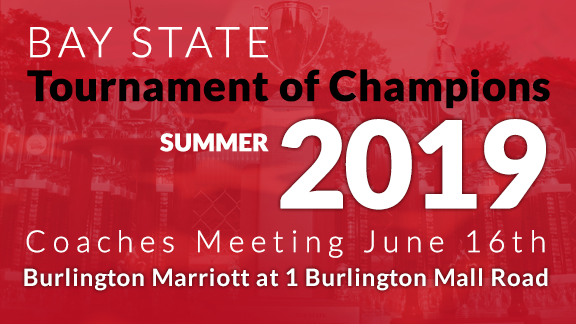 Coaches Meeting is Sunday, June 16th 7:30pm at the Burlington Marriott. 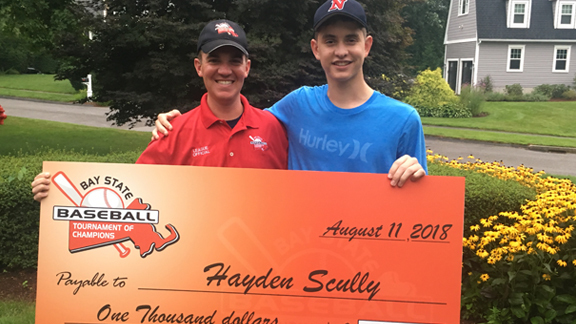 Hayden Scully, a 2018 graduate of Natick High School was the Bay State scholarship award winner. 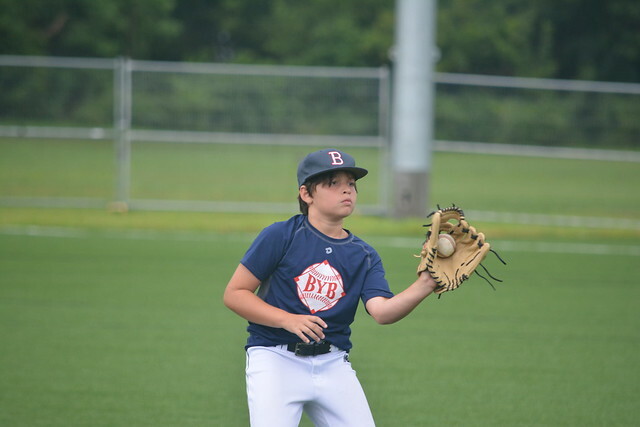 Hayden was a varsity captain his senior year, and excelled in academics in all four years in high school. He will be attending the University of Norte Dame in the fall. 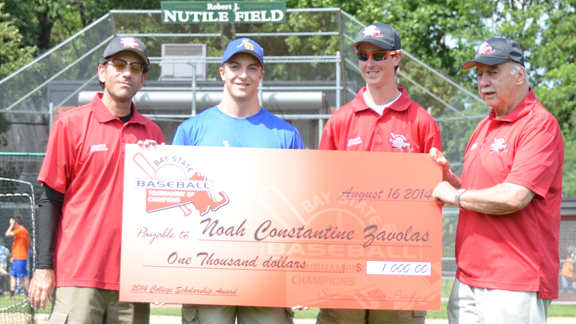 The check was delivered to him personally due to the rain by Bay State board member Matt Lodi who coached Hayden in his Bay State career. 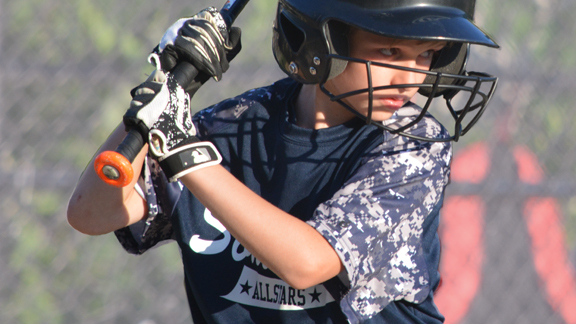 Bases loaded, two out, 3-2 count as Jake Bottari of Somerville D Division stays laser focused at the plate on opening day 2017. 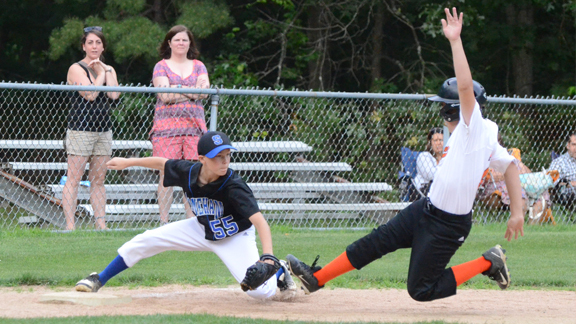 As Chris McDonald from Woburn closes in on Third, Dom Fanara from Stoneham, ball in glove, rushes to get an out. Weafer Park, July 6th in the B Division. 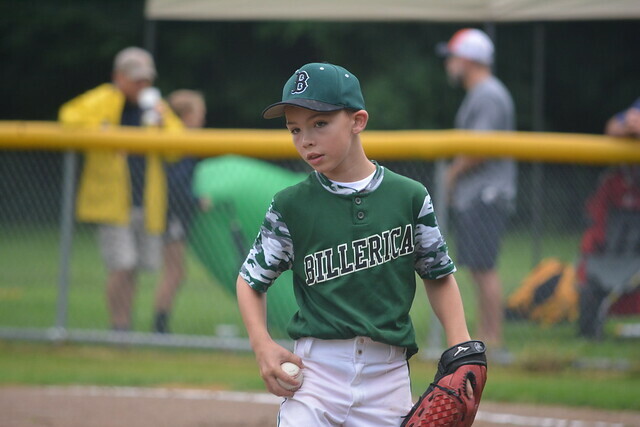 Parents and Players, make sure you check out our Game of the Day photo albums. 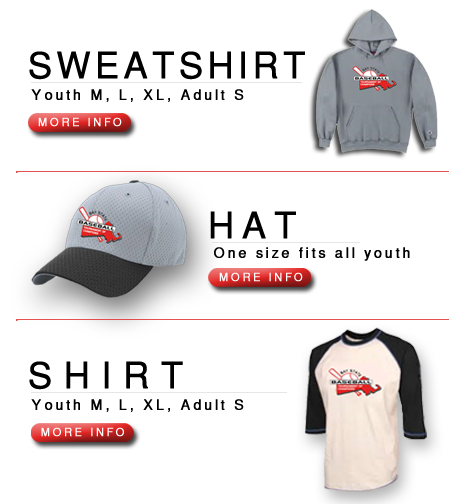 Click on the Game of the Day tab on the home page. Watch for Dominick the Photographer at your next game!! Annika Lawson powers Stoneham to a 5-0 start in the D Division in Round 1. 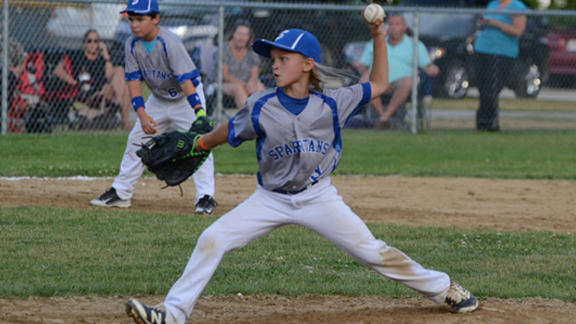 With a strong bat and a tough pitching performance, Lawson and the Spartans beat Andover Yellow 10-4 in our first official "Game of the Day" (see photos in the Gallery). 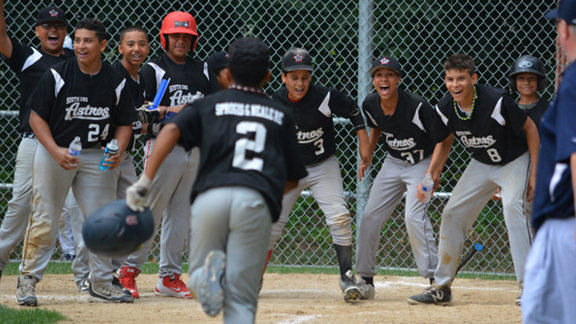 South End players prepare to celebrate their semifinal victory after a booming game-ending home run off the bat of Orlando Santos. 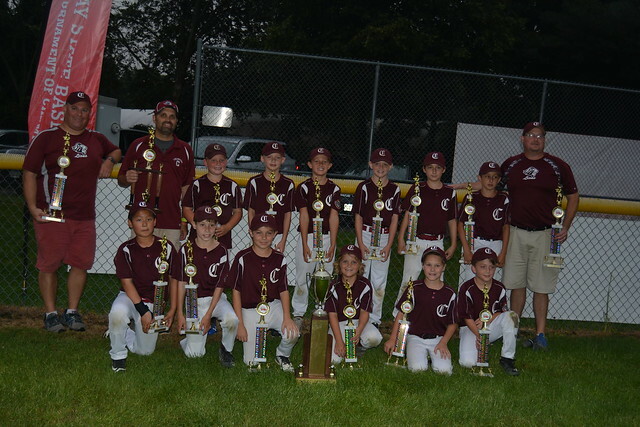 South End went on to win the A-60 championship. 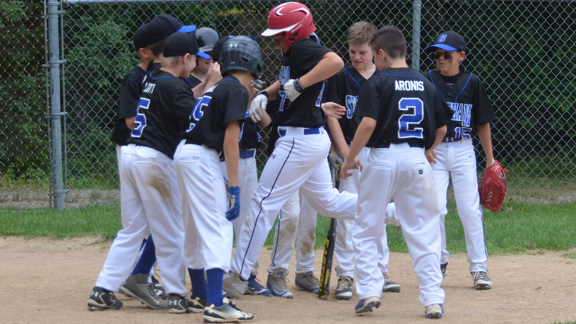 Stoneham B team greets Danny Storella after a 3-run home run. 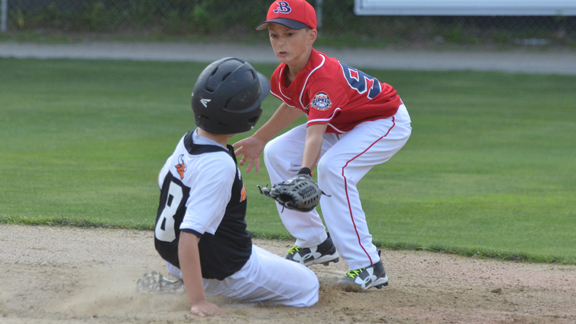 After falling behind by 8 runs to a strong Woburn team, Stoneham put up two strong innings and eventually won in extra innings 21-17. 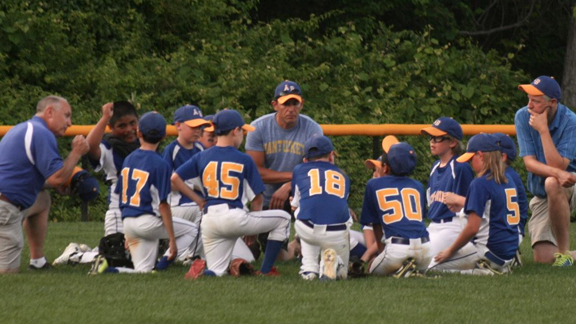 Acton Boxboro C division coaches impart lessons and knowledge after a game, in what all players traditionally call "the time when we get to watch the other kids eat hot dogs." Each year on Player Appreciation Day, BSBTOC awards a $1000 scholarship to a high-school senior from our program. Shown are 2014 winner Noah Zavolas of Bedford, 2013 winner Conner Steines of Acton, President Stephen Zerdelian and Past President Don McGowan. 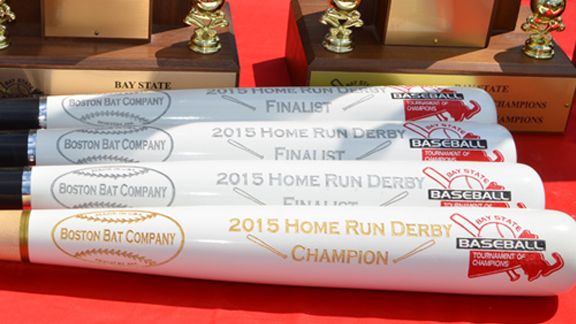 The Golden Bat is presented each year to the winner of the home run derby on Player Appreciation Day. 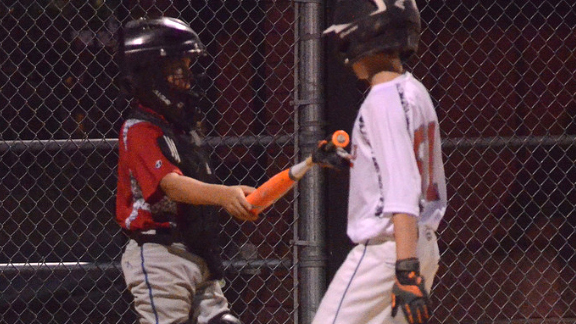 Winchester catcher Milo Schut hands bat to Stoneham hitter Joe Colliton. 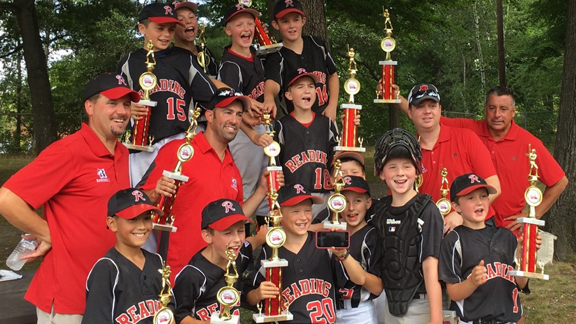 Reading Black C team celebrates TW1 gold trophies. 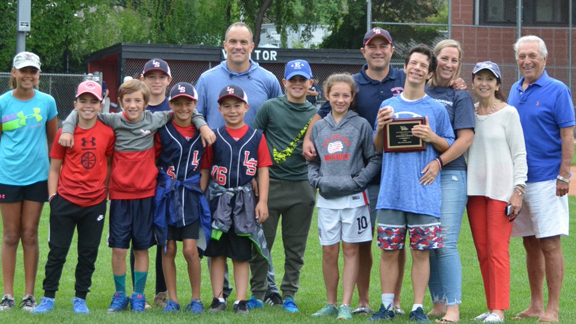 The victory was dedicated to Coach Nick Diranian, who watched the streamed games from his hospital bed. 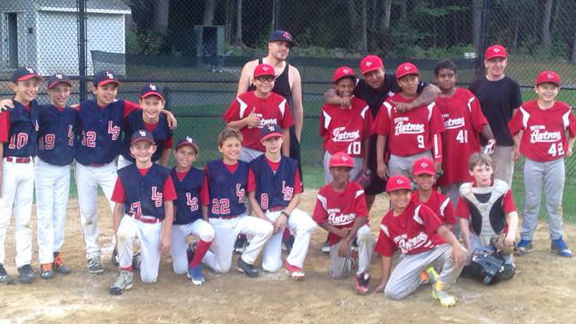 Coach Nick re-joined his team for the final home game on August 1. Rest in Peace, Coach Nick. 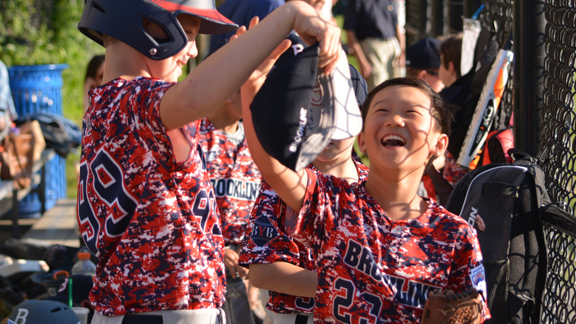 South End parents raise the cheering bar. 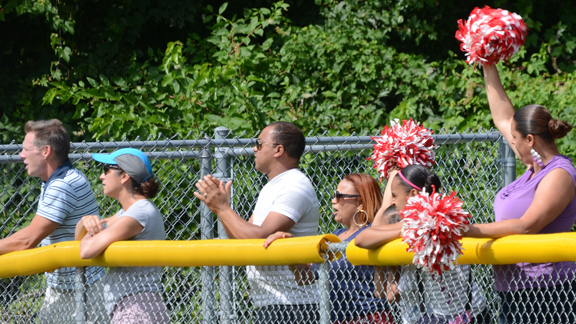 At a game in Winchester, South End parents line the fences and encourage their players with pom poms, bells and chants. 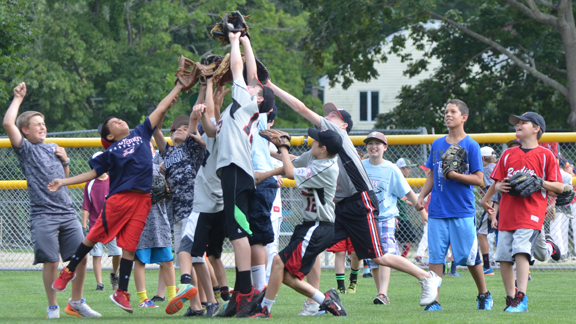 Younger players in the D, C and B divisions participate in the Home Run Derby as outfield ball catchers, just like in the pros. 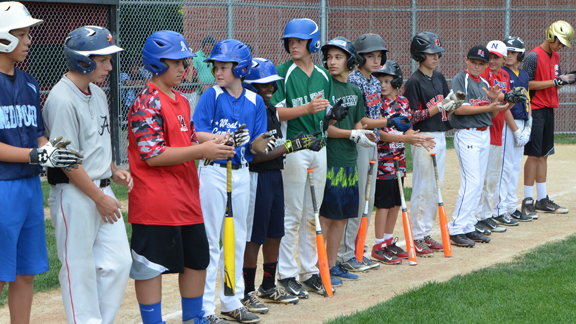 The 2016 Home Run Derby is August 13 in Winchester. 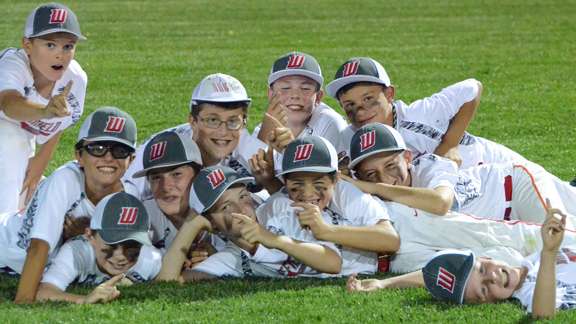 Wakefield B players ham it up for the camera in a non-traditional team photo after a late night game in Winchester, in what has become a new tradition for all teams selected for Game of the Day honors. 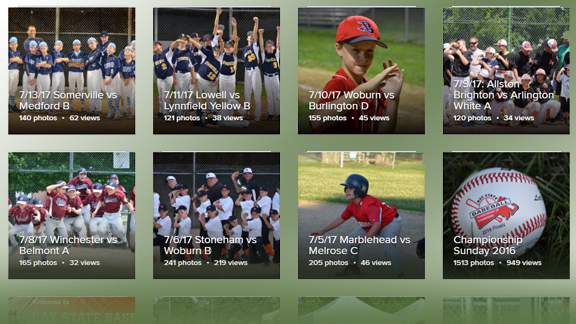 Review all the crazy team photos in the the player Photo Galleries. 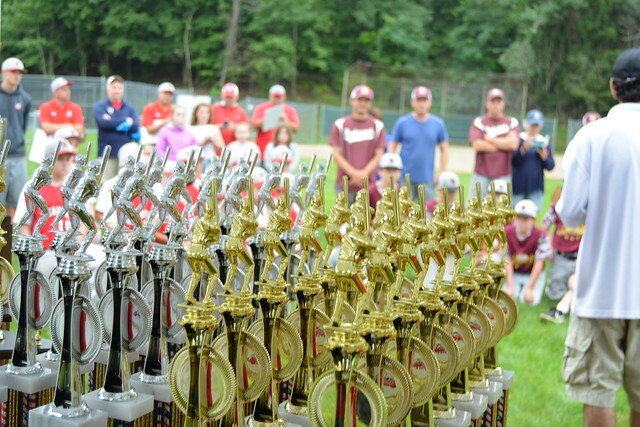 The top 12 A-60 and A-70 power hitters put on a fantastic exhibition during the 2015 Home Run Derby. Damon Kruppa of Reading edged Lee Pacheco of Salem for HR Derby crown. 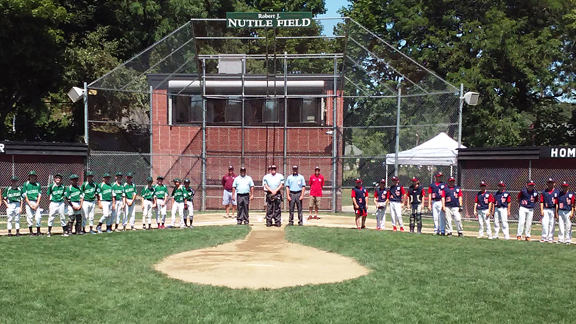 Billerica Black and Sudbury Red line up during pre-game player announcement ceremonies and national anthem. 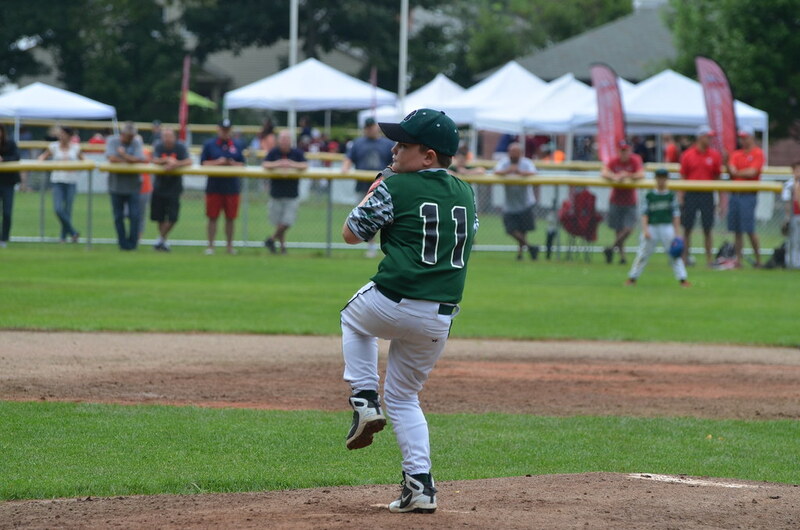 Sudbury and Billerica gave fans a thrilling B-division championship game for 6 full innings that came down to the final pitch. 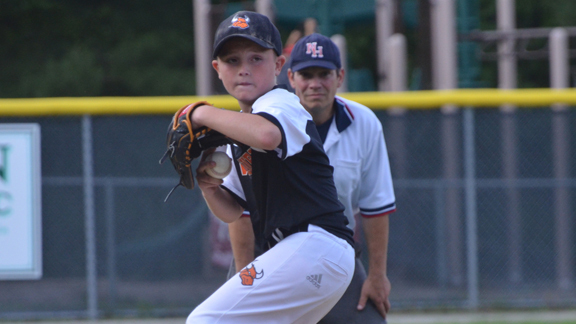 Dylan Sigsbury of Woburn delivers a classic 4-seam fastball to an unsuspecting Burlington batter in C Division Round 1 action. 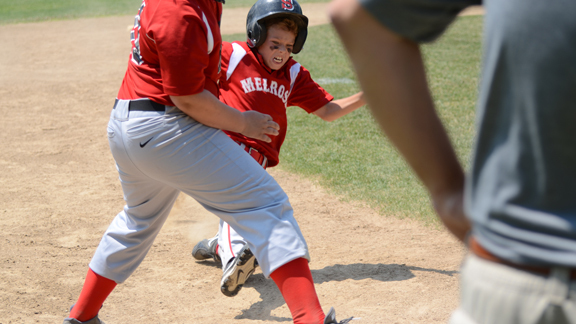 Red haired Quinn McCarthy of Melrose aggressively slides into third base ahead of the catcher's throw to successfully steal third base vs Marblehead. The field was awash with Red uniforms as Melrose raised its overall record to 11-3 with clutch wins vs. Reading and Concord in Round 2. Bay State Baseball SuperFAN award winner Connor Greene of Sudbury posing with his family in center field after throwing out the first pitch. 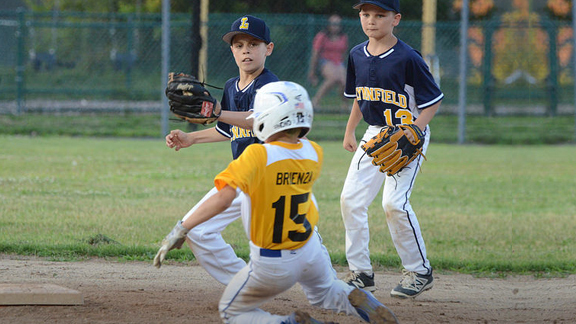 You can view all past Game of the Day action in the Bay State Baseball Photo Gallery section of our website here.